Lalandia Aquadome™ is a tropical waterpark for the whole family, offering world-class watery fun and experiences. Try the many fun water slides, wave pool, spa pools and wellness experiences for both young and old. As a residential guest at Lalandia, you have free entry to the Aquadome. If you are not staying in one of our holiday homes, you can still pay to enter the Aquadome. Day guests do not need to pre-order tickets, as they will only be sold on the door. Please note that your ticket to the Aquadome is only valid once, and that it is not possible to leave the Aquadome and re-enter on the same ticket. During busy periods day visitors to the Aquadome may be required to wait. You are not permitted to bring food or drink into the Aquadome. However, in our waterpark, you’ll find the Oasis, a great option for all the family to enjoy a quick snack or a filling breakfast under the palms. We have child-friendly and functional changing facilities in the Aquadome. They use an armband system so that you can use it for entry to the Aquadome and to lock your locker with. You will receive your armband on arrival. The changing facilities at Lalandia are child-friendly, light and functional, with lots of space and baby changing facilities for the youngest family members in the changing rooms. Before using the Aquadome and pools, you MUST soap up and rinse off thoroughly. All children aged 0-3 years must wear a swim nappy. Swim nappies can be purchased from the Aquadome Shop at DKK 15 each, or you are welcome to bring your own. It takes 45 minutes to empty and clean the children’s pool in the event of an ”accident”. It’s inconvenient for you and everyone else if the pool has to close. You can hire swim vests from the Aquadome Shop. The whole family can swim safely in the Lalandia Aquadome, although your visit is at your own risk – here safety is a top priority. In the Lalandia Aquadome, there are always at least 3 trained life guards keeping an eye on our happy bathers. All lifeguards receive continuous professional training. Each year, they must pass the professional lifeguard exam. In addition, they receive weekly training in resuscitation and first-aid, etc. Thus, our lifeguards meet all the current requirements so they are able to offer rapid, skilled and well-qualified rescue efforts in emergencies. Lalandia’s safety rules fulfil – and further build on – the guidelines issued by the Danish Council for Greater Water Safety in cooperation with the Danish Ministry of Justice, the Ministry of Health and Politimesterforeningen (the Association of Danish Police Constables). No bathing equipment such as swim wings and bathing rings are available in the Aquadome, but you are welcome to bring your own or purchase them from the Aquadome Shop, where you can also buy swim nappies and waterproof baby pants. If you have an Exclusive card for Lalandia in Rødby, you get, among other things, free admission to the Aquadome and Monky Tonky Land. Please note that only the cardholder is granted free admission, and it may be necessary to wait during busy periods. You can buy your Exclusive card at Sport & Bowling, where your card will be issued immediately and you can also choose to receive e-mails with special offers and other benefits. You start your descent through the super-fun Tornado water slide with views of the Baltic Sea and Germany. Cascades of water, high speed and lots of experiences you won’t want to miss. With up to 4 people at a time, there’s plenty of speed and excitement in the eye of the hurricane. A huge water playground, where the 5 water slides offer hours of play for anyone with a love of water, fun and speed. Remember to keep an eye on the giant bucket at the top, which empties 1200 litres of water all at once. 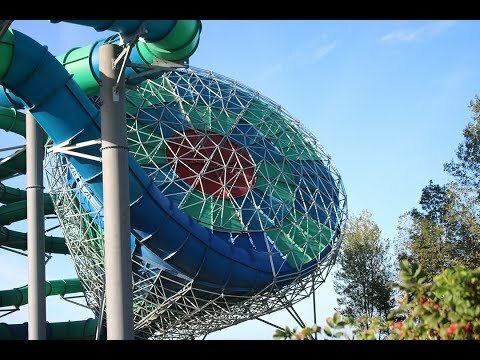 Pipeline is one of the fastest water slides at Lalandia in Rødby, which starts high above the ground and offers over 100 metres of high-speed sliding and lots of surprises. With its 95 metres outdoors, Wild River is for anyone who likes a challenge and a speed-filled ride. The water slide starts and ends indoors, with the twisting turns taking you outdoors in between. Explore the Kids Area, the fantastic bathing area for 0-5 year-olds in the Aquadome. The Kids Area is secluded from the rest of the Aquadome, so there is plenty of peace for splashing around and playing in the fun tree trunks and taking a trip down the little water slide. Allow the little ones to explore the snug oasis for our very youngest bathing guests in the Aquadome. The wave pool is the place for fun and games as the waves delight adults and children alike once an hour. Children can also participate, as the wave pool, due to its sloping bottom, has a water depth of 0-185 cm. The cave pool is ideal for family time on the underwater benches placed along the edges of the 155-cm deep pool. You must enter through a small waterfall to gain access to the secret cave. In the Aquadome, you’ll also find the stream pool, where underwater benches along one edge of the 120-cm deep pool create a place for relaxation for adults, while children enjoy themselves in the water and have a go in the pool’s fun stream channel. The outdoor pool offers hours of entertainment and active relaxation in the water. The pool is warm all year round, and you can move freely between the indoor and outdoor pools. Lalandia in Rødby has its very own huge water playground, idea for speed and many fun-filled hours. Our Aqua Splash Playground features 5 different super-fun water slides, so there is something to suit every taste and age. Whether you like surprises, water, play or speed. Experience the rush when the giant bucket empties 1,200 litres of water all at once. Beware of the many water fountains, water cannons and buckets, which can empty at any time and anywhere. Here children can splash around in the 25 cm deep water, which is 34°. And while mum and dad enjoy lots of time together and fun, the children can discover the attractive aquatic animals or head down the small water slides. The outdoor area has been designed with the very youngest members of the family specifically in mind. Here, children can slide down the small water slides and play under the waterfall. The pool is 40 cm deep and offers lots of fun play facilities. Pamper yourself with a wellness session. Enjoy a session in the jacuzzi or relax in one of the many lounge chairs. The daylight streams into this large, light sauna with panoramic views of the Baltic Sea. Here you can experience an atmosphere of peace, warmth and wellbeing as you enjoy the view over the land and sea. Pamper yourself with a relaxing and de-stressing session in one of the jacuzzis. The water is a pleasant 37°, and the effervescing bubbles provide a beneficial massage. The outdoor spa pool offers plenty of warmth and well-being together with the family all year round. With the steamy 37° water and pleasant bubbles, you’ll think you’re in one of Iceland’s blue lagoons. The changing facilities at Lalandia in Rødby are child-friendly, light and functional, with lots of space and baby changing facilities for the youngest family members in the changing rooms. We do not use keys, but an armband system where the armband, which will be provided on arrival, is also used to lock the lockers. All children aged 0-3 years must wear a swim nappy. Available to purchase from the Aquadome Shop for DKK 15 or you are welcome to bring your own. It takes several hours to clean the children’s pool if there is an “accident”. It’s annoying for you and everyone else if the pool has to close. In the Aquadome, you’ll find the Oasis, a great option for all the family to get a quick snack or a filling breakfast under the palms.